Accommodation & Food Service includes all those working in hotels, guesthouses, pubs, clubs, restaurants, takeaways, coffee shops, catering companies and mobile food / coffee vans. Essentially it is the hospitality industry. The Western Region is home to 19.7% of everyone working in hospitality in Ireland and 23.7% of all of the sector’s enterprises. According to Census 2016, 23,038 people were employed in Accommodation & Food Service in the Western Region. It plays a greater role in the region’s labour market than nationally (Fig. 1) accounting for 6.9% of total employment compared with 5.8%. 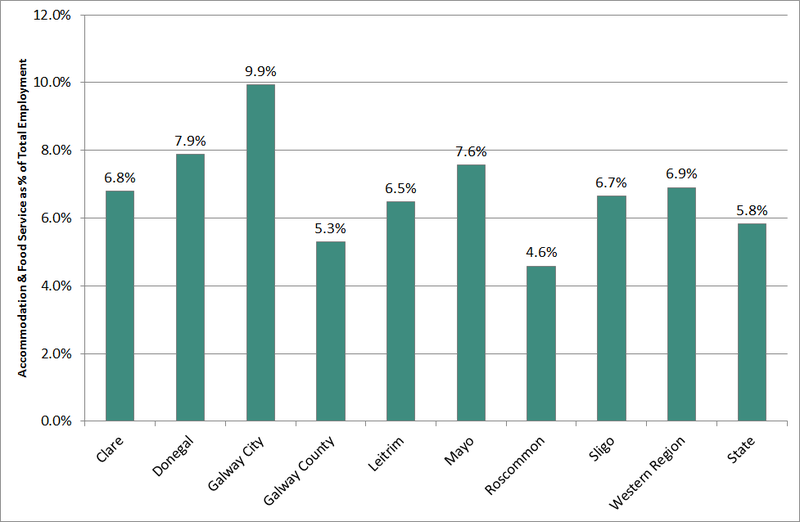 Among western counties, it is most important in Galway City at 9.9%, followed by Donegal and Mayo. These three counties are among the top five in Ireland in terms of the share of their workforce engaged in hospitality. Roscommon has the lowest share in the region and is fourth lowest in the state. At 27.6% of total employment, Clifden has the highest share working in hospitality of Ireland’s 200 towns and cities (1,500+ population) with Bundoran (21.7%), Westport (21.1%), Donegal town (20.3%) and Carrick-on-Shannon (15%) also among the top 10 towns in Ireland. At under 6%, Ballyhaunis, Ballymote and Boyle have the lowest shares working in the sector in the region. Hospitality is a more important employer for women than men (Fig. 2) with 8.2% of all working women and 5.8% of all working men in the Western Region working in the sector. The sector plays a more significant role in both female and male employment in the region than nationally, most notably for women. Galway City, Donegal and Mayo are where hospitality is most important for female employment employing close to 1 in 10 of all women. In the case of Donegal and Mayo the sector is considerably more important for women’s jobs than men’s. 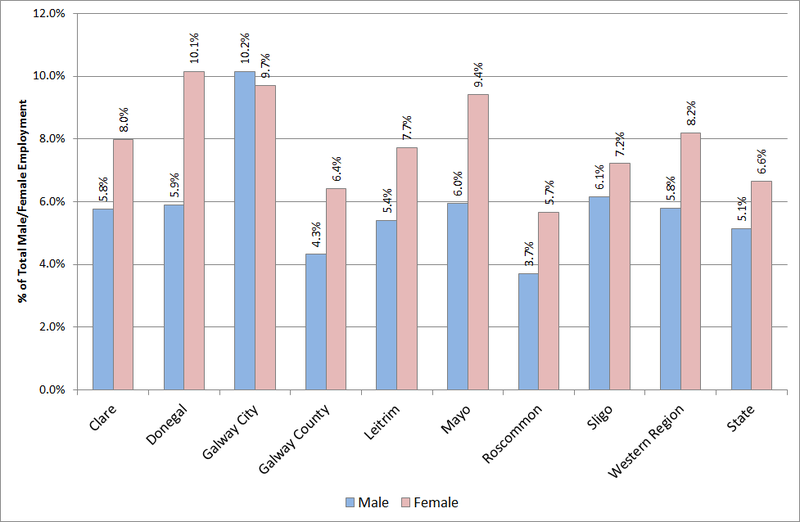 Galway City is the only area where hospitality is more important to male than female employment however the shares are quite similar indicating the sector is more gender-balanced, as it also seems to be in Sligo. 14.1% (3,237 people) of people working in the sector are self-employed (employer or own account worker). The Western Region has a considerably higher incidence of self-employment than the national average (11.5%). This could indicate that hospitality operations in the Western Region tend to be smaller in scale with fewer employees and that owner-manager/family-run businesses are more common. The extent of self-employment declined between 2011 and 2016, most strongly in more rural counties. In 2016 there were 4,358 Accommodation & Food Service enterprises registered in the Western Region which was 23.7% of all such enterprises in the state. This is the sector where the region accounts for its highest share of all enterprises nationally. Hospitality accounted for 10.2% of all business economy enterprises registered in the Western Region 2016. Donegal, Leitrim and Mayo have the highest share of enterprises in the sector at 11+% showing the importance of the sector in their overall enterprise profile. Accommodation & Food Service plays a larger role than nationally in the Western Region’s economy, in terms of its employment profile and enterprise base. Any changes in demand for this sector e.g. from Brexit, an economic downturn, will have a particularly large impact on the region and national policy needs to address issues specific to the region such as improved accessibility for visitors and the viability of rural hospitality businesses relying on local demand. As it is quite widely distributed, hospitality helps to sustain the regional and rural economy and is becoming an increasingly important reason for people to visit town centres. Therefore it is a critical element in town centre renewal efforts. It is also an important source of jobs for those with lower skills or limited experience, whose rights need to be protected, as well as providing highly skilled occupations and considerable opportunities for entrepreneurship. Self-employment, while still higher in the region than elsewhere, is declining and it is important to support and encourage self-employment to maintain the diversity of the region’s hospitality offering. Hospitality is highly sensitive to changing economic conditions which influence both the level of disposable income of local residents and overseas and domestic tourism activity. The balance between local and tourist demand in sustaining the hospitality sector varies considerably across the region (from tourism ‘hotspots’ to small rural towns depending on local custom) and policy aimed at strengthening the sector needs to be tailored to the specific circumstances of different areas. Rural and border counties are particularly exposed to Brexit while the sector as a whole needs to adapt to emerging trends e.g. Airbnb, changing demographics, low carbon economy. The report also examines data on overseas and domestic tourism revenue and numbers to the Western Region, which will be the subject of a future post. Business economy includes all economic sectors except Agriculture, Forestry & Fishing, Public Administration & Defence, Education, Health & Social Work and Other Services. Travelling from the Western Region to work in Dublin. How has it changed and Why? How important is Wholesale & Retail in the Western Region?